Our laboratory facilities host precise diagnostic equipment used in preventative care and early detection. Effective heart disease treatment begins with early detection. Electrocardiology is the best tool to analysis your pet’s heart health. An electrocardiogram is used to determine heart rate and rhythm, discovering any abnormalities in the process. Should an arrhythmia, or any other condition, be uncovered, treatment can commence. An electrocardiography device detects minute electrical changes on the surface of your pet’s skin caused by heartbeat movement. Small electrodes called leads are covered in conducting gel and gently placed on the skin. The leads monitor heartbeat activity, recording irregularities if they are present. This process is non-invasive and painless. Veterinary diagnostic imaging creates composites of the internal body used to discover disease or injury. South Broward Animal Hospital employs advanced imaging technologies, guaranteeing the highest quality of care for our patients. Some specialized procedures may require anesthesia. Orthopedic radiographs and contrast studies require the patient remain completely still to work correctly, necessitating sedation in most cases. The duration of sedation is usually short and patient recovery is swift. 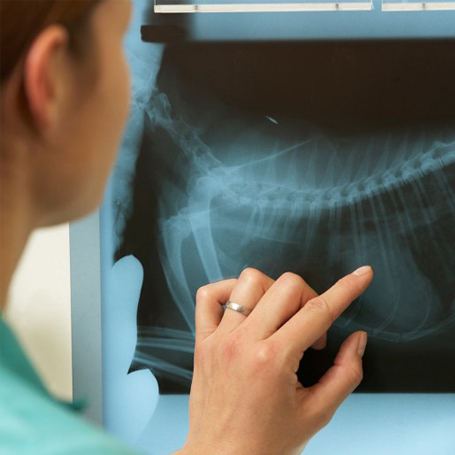 Radiographs, ultrasounds, and CTs are performed by a mobile specialist at our facility. Due to the limited number of times available, please contact us to make an appointment.